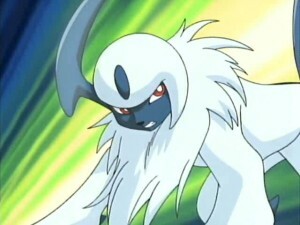 First, we have the great and noble Absol. Absol is unjustly known as the PKMN of disaster, and the fact that he’s a Dark-type doesn’t help his case. He’s 3′ 11″, with weaknesses against Fighting-types, Fairy-types, and Bug-types, but a strength against Ghost-types and Psychic-types. He comes with the common abilities Super Luck or Pressure, or the hidden ability Justified; he also has the ability to Mega Evolve. As you might have guessed, I have placed Absol in the Misunderstood Pokemon category, along with one other friend of his. But, before we start talking giant, flying, destruction-bringing turkey, let’s get to know Absol a bit more. As you might have noticed, I claimed that Absol here is known unjustly as the Destruction PKMN. In the beginning, when Absol was first inputted into Pokédex, it was believed that Absol was the halberd of destruction, and that wherever he went, damage and horror was sure to follow. Of course, none of this was true. The truth is, that Absol have the unique ability to sense impending disasters, and they always try to warn the humans nearby. When the destruction came to pass, the unfortunate humans always assumed that it had been the work of Absol, and so the Destruction PKMN it came to be known as. Poor Absol, he was constantly blamed for what he did and was chased away. If an Absol showed up around your house, it was believed to be bad luck, and that the PKMN was there to destroy everything in his path. Still, though, he tried to help the people in danger, despite the repercussions. Like I said, a very noble PKMN. Absol is a pretty decent PKMN, with a base Attack stat of 130, and a Special Attack stat and Speed stat of 75. Plus with moves like Razor Wind, Dark Pulse, and Sucker Punch up his sleeve, he can make pretty good use of those stats. Not to mention that fact that he can use TMs (Technical Machines) to learn moves such as Thunder, Blizzard, X-Scissor, Fire Blast, Sand Tomb, Will-o-Wisp, Charge Beam, Shadow Claw; really, the list just goes on forever. 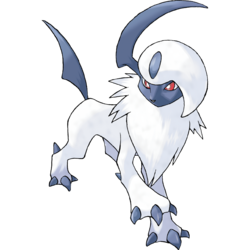 Plus, Justified is a terrific hidden ability for Absol, because it turns one of his biggest weaknesses into an advantage. And we haven’t even gotten to Mega Absol yet! 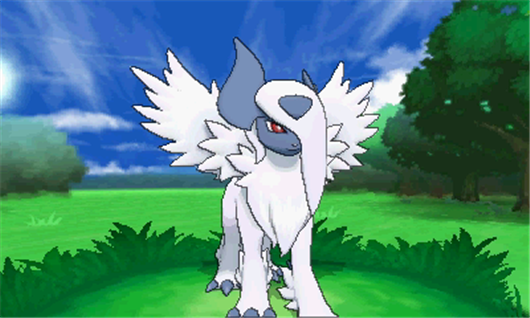 Here’s Mega Absol. With a whopping base Attack stat of 150, and a base Special Attack stat and Speed stat of 115, he packs an even bigger punch than his normal form. 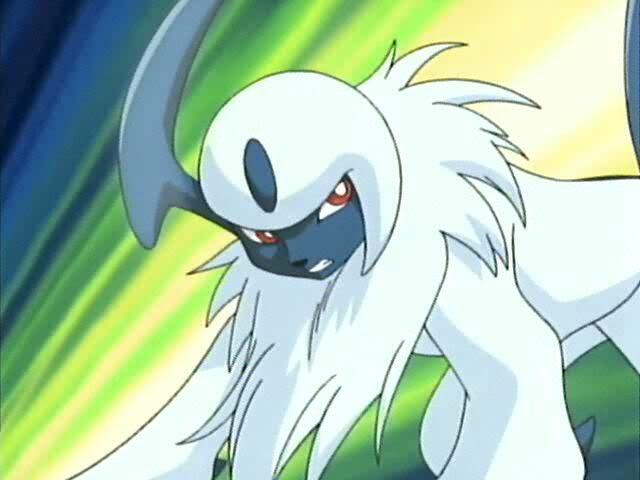 Of course, there may be some tactical reasons to Mega Evolve someone else instead of Absol, but even without Mega Evolution Absol will always be pretty formidable. Of course, we’ve spent all this time talking about the PKMN of Disaster, why not spend some time talking about the PKMN of Destruction? Behold, Yveltal, the Pokémon of Destruction and legendary PKMN of Pokémon Y*. With a height of 19′, this formidable bird is a beast. He’s a Dark and Flying-type, with the ability Dark Aura. Due to the fact that he’s a legendary and was released in generation six, he has no hidden ability. He has weaknesses to Electric-types, Rock-types, Ice-types, and Fairy-types, with a strength against Ghost-types, Psychic-types, Ground-types, and Grass-types. His signature move is Oblivion Wing, and he is the bringer of destruction, destroyer of worlds. 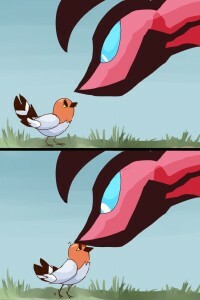 Unfortunately, as much as I love Yveltal, it’s true. 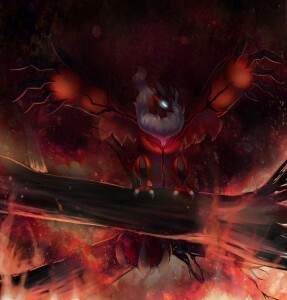 When Yveltal’s life is near its end, he will spread his wings and tail wide, and with an ominous dark red glow emanating from his body; Yveltal absorbs the souls of everything around him and sleep, the last time this happened was roughly a thousand years ago. Of course, just because Yveltal does this, doesn’t mean that Yveltal is an evil villain. He takes souls for survival, true, but that doesn’t mean he does so with malevolent intent. Yveltal is just one PKMN struggling for life just as much as the next guy, and the way he goes about it happens to be thought of as cruel by the rest of the world. Of course, I could be totally wrong; what if Yveltal really is a cruel, horrid beast? Let’s weigh both sides of the matter and try to figure out if its really evil, shall we? First, the horrible beast side: What if Yveltal is evil? Well, this side of the argument is rooted mostly in Yveltal’s very nature. If we are to believe that Yveltal truly takes the lives of everything around him to fuel his own life and live longer, that would suggest that there has only ever been one Yveltal in existence, and that he has been living for thousands, if not tens of thousands of years. Even if he wasn’t evil in the beginning of his life, living for so long and watching the human race become slowly and slowly less great and kind, his heart would probably have become hard and cold. He still might not have found joy in stealing the lives of others necessarily, but certainly he wouldn’t have found any remorse in it. This is a rather unfortunate way to think of Yveltal, isn’t it? I’d much rather think of him in his lighter nature. So; What if Yveltal was good? This argument, ironically, fits not only with his own stories, but also with the stories of Xerneas**. Much like Yveltal, Xerneas has a major impact on the world when he falls asleep. However, instead of stealing life before he sleeps for so long, Xerneas gives life to all of those around him before he closes his eyes. Interesting, no? 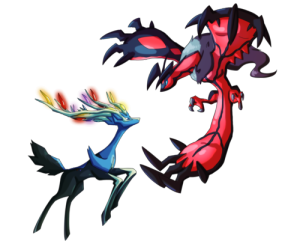 There’s a reason Xerneas is portrayed as the PKMN of Life (that and the fact that Xerneas can give eternal life to people if it wishes too), and why these two are often shown as enemies. But, are they really enemies? Think about it, these two might be bitter enemies; their very beings and natures clash with each other. But, couldn’t they also be friends? The stories say what these two do when they fall asleep apart, but imagine if these two had fallen asleep together? Yveltal would fall asleep and wrap himself up in his cocoon, stealing the lives of almost everything around him, and then Xerneas would fall asleep and become a giant, towering tree, bringing back to life everything Yveltal had accidentally slain. Oh, by the way, from what I know, Yveltal and Xerneas have always slept for the same amount of time, at the same time. They even woke up at the same time, if you think about it. Please note, dear skeptics, that the Pokédex says “share”, which suggest that not only can Xerneas give others eternal life, but that he has eternal life of his own. So that means Yveltal can’t accidentally absorb Xerneas’ spirit. Maybe on its own this information isn’t enough to suggest the two PKMN may be friends; but here’s the other thing, Xerneas and Yveltal have both been around for thousands of years, and supposedly neither PKMN has yet to die. That is most certainly not a possibility if these two have been warring with each other as they would have if Yveltal was evil. And so, that would also suggest that these two PKMN are been friends, or at least allies. So you can choose which side to take, Edward or Jaco- I mean, good Yveltal or evil Yveltal. Now, let us move on to the rough-and-rumble stuff. Yveltal’s favorite selling points for me are his base Attack stat and his base Special Attack stat, which are both a whopping 131. His second best (or third best, whatever you want to say) is his Health stat, which is at a pretty good 126. 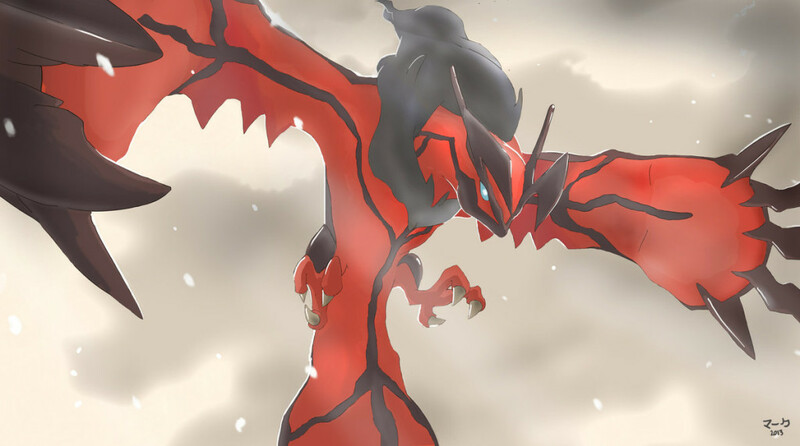 Then there’s Yveltal’s signature move, Oblivion Wing. 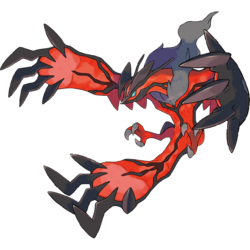 Oblivion Wing is basically a Flying-type version of Mega Drain or Giga Drain; it can be used to attack the enemy PKMN, and heal Yveltal by somewhat over half the damage he dealt. I would just like to say, this is a much better signature move than Xerneas’ Giomancy (Dear readers, please don’t yell at me, this is just my opinion). So everyone, what do you think of the disastrous duo? Do you find them dark and dangerous, or cute and misunderstood? The decision is yours, dear readers. Enjoy the rest of your day, and merry Pokémonth! *Yveltal has no gender, being polite. **Xerneas also has no gender, again being polite.